This one was made using paper only-NO STAMPING! AHHH! Actually, I find it freeing to use no stamps once in a while. I don’t have to worry about how to colour the image, what colour paper and ink etc. This card is for a sketch challenge, Sketchy Thursday #52, ESS52. It is also for SCS Ways To Use It-Red. WT235. Scroll down for a second post! Don’t you love it when you can use the front and back of a sheet of paper and still have tons left? This Webster’s Pages sheet has multiple cool vintage labels on one side and a beautiful star pattern on the back. I cut carefully around this oval label and hand cut the two mats around it. The brown paper under the twill tape is a dictionary page covered in tattered leather Glimmer Mist. 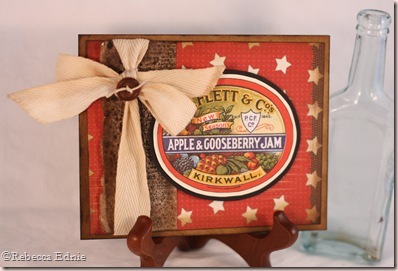 The base is Kraft sponged with Vintage photo Distress ink. Next postCards for Kate – Whimsical Wednesday! I'll give another one word – FABULOUS!! !Love the vintage look of it Bec! One word girl…….AWESOME!!!! Wow!! I LOVE everything about it!! Hope you are well! !Take care!Jacquie/Javablustamper!